Green Monster Smoothie | Naturally. The good news is that on Thursday I leave for Las Vegas to spend four days with one of my best friends (who is getting married!) This means lots of sun, fun, and photography (which I can’t wait.) Other than that, my summer plans are still somewhat up in the air. However, I decided that since I am taking the summer off to enjoy, I needed to really focus on my health, diet, and exercise. 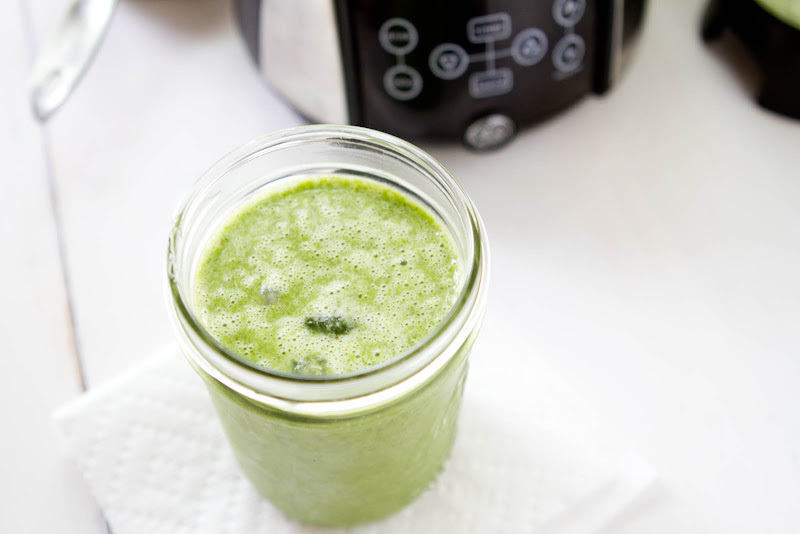 Enter in this green smoothie. I’ve seen many versions of this floating around the internet but I knew that I really didn’t want to make one until I got fresh spinach from the farm. If I was going to drink spinach for breakfast, it was going to have to be fresh spinach. 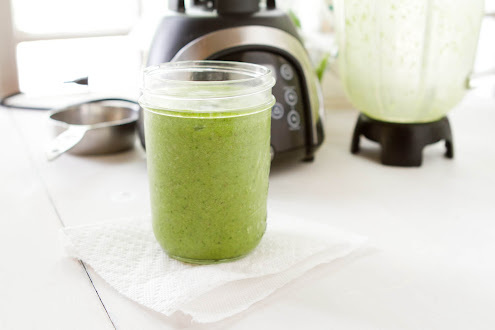 So finally on Thursday, I got my spinach and the next morning I made this smoothie for breakfast. The verdict? I’ll definitely be making this again. The banana added just enough sweetness to cover the spinach taste and I felt good drinking a healthy dose of fruit and vegetables for breakfast. I also can’t wait until I start getting blueberries and strawberries from the farm so I can mix it up a bit! If you’re still wondering whether or not you’d be brave enough to try it- just do it! I really don’t think you’ll be disappointed! Place ingredients in a blender starting with almond milk ending with the banana. Pulse on high until perfectly blended. If you want it colder, add a couple more ice cubes. YUM, this looks delicous! Thanks for the recipe! I had one of those for lunch yesterday, practically the same recipe too but I used a frozen banana and threw in a few strawberries, too. Lovely post! Green monsters are one of my favorite kinds of smoothies. So healthy and satisfying. I love green smoothies! Aren’t they fantastic? I hate bananas do you have a suggestion for something else to add sweetness? I made my first green smoothie a couple of weeks ago and I was surprised at how delicious it was. Spinach, a few grapes and cucumber make a great mix. How does everyone get the spinach pulverized enough not to have green chunks. I made a green monster one time, using kale and while the flavor was fine the kale flakes were not so good. I’ve only heard the Vitamix as a solution and I am not made of money. What else ya got? I first bought a Juiceman that was able to juice the greens (which left me with no chunks.) However, I really wanted to use ice cubes so I went and bought a cheaper GE blender and it works like a charm. I use spinach, (alot of spinach about 3 huge hand fulls) never tried kale, but I will put the spinach in last, I use frozen banana so i use my cheap ole wal mart blender ($12.00), put the setting on low and hit the crush ice a couple of times, open the blender and use a spoon to push the spinach down, hit the blend button on low for about 30 seconds to a minute, turn it off and push everthing down again with a spoon, then hit the blend on high and let it blend for about 2 minutes. Everything is smooth and creamy when I do it this way. Thanks for the recipe! I added a few strawberries as well! Yummy! 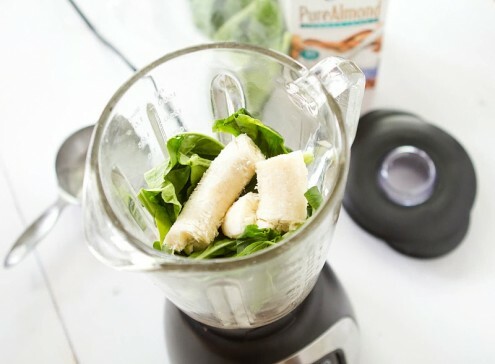 Erin – if you blend the almond milk and the spinach together first, you will eliminate the chunks and then add the other ingredients, it will be a smoother finish! Tastes great! Would taste even better if the banana was super ripe. 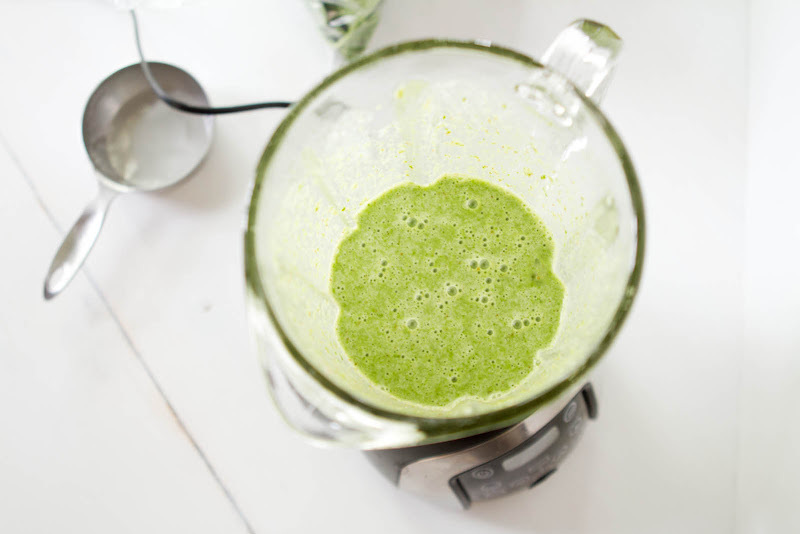 Banana and Spinach are a great combination. Excellent recipe!